While taking the time to sit and muse in front of a window during this busy time of the year, my mind drifts back through the tunnel that is the year soon to pass by. Blessings of every shape and color appear as if in a dream. As they drift along, one by one, I am amazed that the painful parts of the year do not even surface. It seems as though my simple mind can not think on loveliness and tragedy at the same time. Good is shining so brightly that the bad is lost in the shadows. An ice fog has enveloped me in its deceptive cloak. It is very cold outside (near zero), and there is a glow of a promised day. The glow is growing brighter by the minute and slowly the fog is thinning. A new day is upon me along with all of its surprises. An air of expectancy surrounds me and I am trapped in a trance of enchantment. It is such a comfort to once again have a kitty snuggled here beside me. No matter what their personalities my be, kitties always bring much happiness into my life. Bonnie is such a delight, even with her unusual (for a Persian) personality. She talks endlessly and looks me right in the eye, waiting to see what is the next fun thing that I will bring into her life. I am always struck how much she trusts me. Hers is a life of faith; that I will always do the right thing in my dealings with her. Often, I am humbled by the comparison of her faith and trust in me, and my faith in the Lord. I am also inspired by her sense of security. As the morning sun is gallantly piercing its way through the morning fog, pale gray is being transformed into rich pastels. 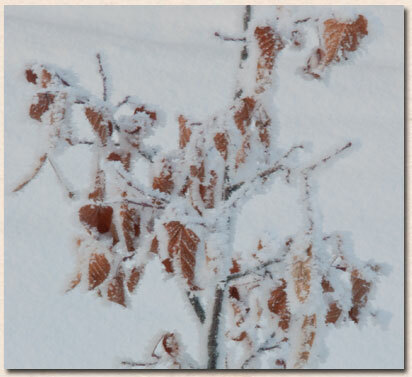 All manner of tree limbs and bush twigs are outlined in crystalline ice. Glitter has been thrown out of the sky, beautifying the mundane. Winter continues to delight with its contrasts and surprises. As this year draws to an end, I am thankful for this season of contrasts and surprises. For it announces the coming of the new year in such a way that I am forever held in its mystery. Allowing myself to be enchanted never fails to open the door to excitement. Whatever comes my way in the year that is waiting in the wings, is sure to surprise me and I find myself leaning forward. Deep in the middle of the night, I was awakened by....silence, muffled and deep. A pink glow filled my bower and all was quiet. I was cocooned in a white blanket of pure, white snow. 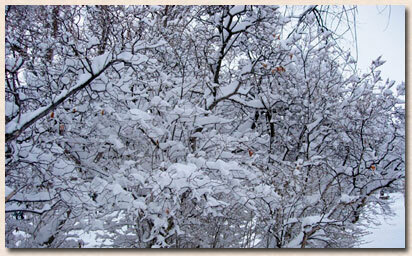 By morning's dawn, the landscape surrounding my abode was thickly frosted in white. Snow is God's gift to us during the dark, cold months of winter. With it comes reflective light that brightens my realm and brings with it much enchantment. Even going outside to shovel provides exercise and fresh air. Often, I amuse myself by shoveling crystalline snow up and into the sunlight, producing a shower of glitter. Similar to the speed and tenacity of rivers flowing out to a sea, the month of being thankful has quickly and silently moved into the month of giving. December, along with its day of the winter solstice, seems to be the darkest month of the year. There is no better time of the year for giving to others, may it be in material terms or simply of ones self. The art of giving always lifts my spirits when I am living through a dark time. Kindly reaching out with a smile or a word of kindness never fails to take my mind out of negative thoughts and brings a ray of sunshine into my heart. It works absolutely every time. The feeling has come over me that I am entering into a new season of my life. Whether or not it is a smooth phase, I have not a clue. But things will be different, to be sure. The realization that I have everything I need in my life to be happy and content is freeing. That realization brings with it such peace and freedom from the cravings of this world. In fact, I am happiest outside in the fresh air, gazing around at my beautiful surroundings. Living the beautiful life has nothing to do with surrounding one with objects. It has everything to do with inner contentment. Lasting happiness comes only from an inner serenity and that only comes from realizing the world really has nothing to offer. Peace only comes from trusting and knowing that God has provided every need and has graciously thrown in a few “wants”. As my mind wonders here and there through these thoughts, I realize what a blessing it is that I only have to live each day, one at a time. The present day is full enough and usually something delightful makes itself known. But then again, to be easily amused is a blessing in and of itself.